High Ground 2 is a new Battlepack that includes the best of the original High Groundâ„¢ release from Heat of Battle. From the original pack, the 2 unique map boards that make up the hill are included, and 7 of the original 8 scenarios have been updated. BFP has expanded on the original product with 9 new scenarios, two new challenging map boards depicting mountains with village terrain, and a specialized half-board castle overlay. "Corregidor : the Rock (CtR)" takes a detailed look at the battles for the island of Corregidor, located at the entrance to Manila Bay in the Philippines, during both the Japanese invasion in 1942 and the subsequent U.S. retaking of the island in 1945. 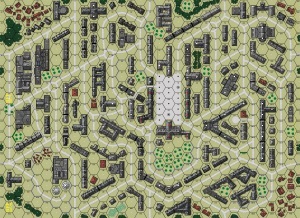 More Bocage for Normandy fanatics ! The size of this product is unprecedented by any other module, magazine, or scenario pack. This has been under development for over 8 years, and the scenarios - yes, all 47 of them - have been thoroughly playtested. There is a wide variety of actions from all over the PTO including the wood-covered hills and plains of China, the jungles and villages of Burma, Borneo and the Philippines, the bloody beaches of Tarawa.and many other locations throughout southeast Asia and the Pacific. 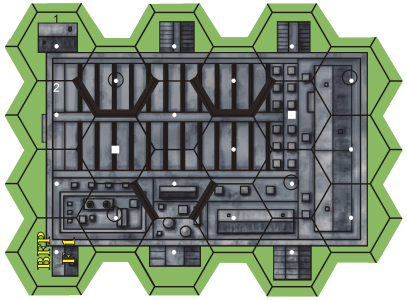 The first ever double-wide 16"x22" geomorphic mapboard. This map represents a large urban area, made up of buildings and huts. (BFP DW-1) This is actually printed in two 8"x22" sections on heavy card stock. BFP 4 : Crucible of Steel is a another huge game package that will thrust players into the battles of Kursk. This is meat and potatoes ASL, so there is plenty of action in Crucible of Steel for everybody ! Into The Rubble 2 builds on BFP’s initial offering, adding 12 new and exciting scenarios in addition to the 8 which came in the original pack, in addition to new boards, overlays and counters. Everything from the original ITR is here, all known errata has been incorporated, and some of the original scenarios have been adjusted for play balance.